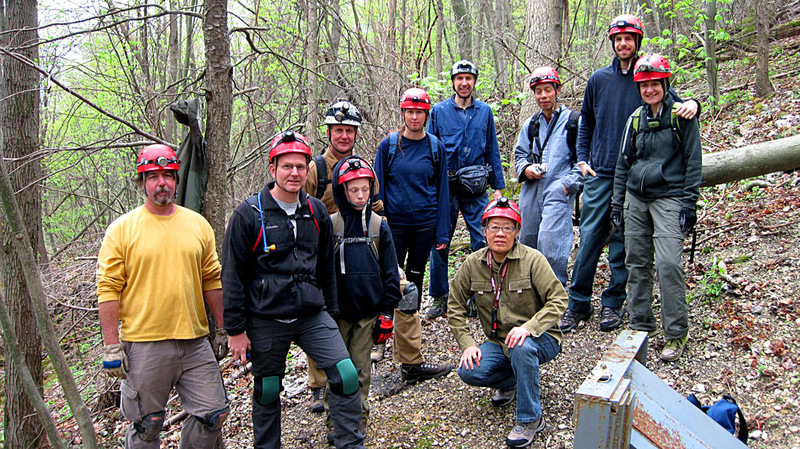 A joint collaboration between the York Hiking Club and the York Grotto produced a good turnout for the combined McAlisterville cave trip and Peter’s Mountain hike. 9 members of the York Hiking Club(Betty, Elyshia, Sean, Emily, Paul, Mike, Todd, David and David jr), along with 2 members of the York Grotto (Mike Shank and myself) met at the commuter parking area at the Peter’s Mountain commuter parking lot . We combined vehicles, headed up to McAlisterville and geared up for an exciting adventure underground. Here is the crew posing by the entrance gate. They’re nice and clean, but not for long! 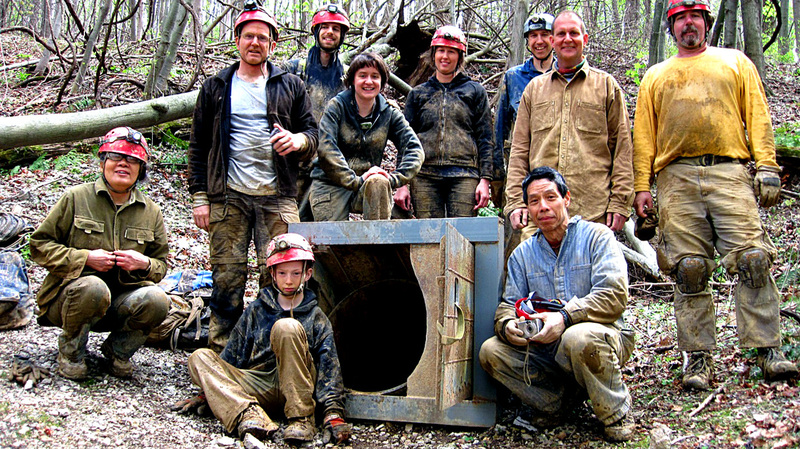 The lock which secured the gate to the cave was reluctant, but finally yielded and gave the York Hiking Club members their first glimpse into the void of McAlisterville. I was polite enough not to mention that snakes often like to hang out in the entrance area, figured if any were there we’d deal with it. 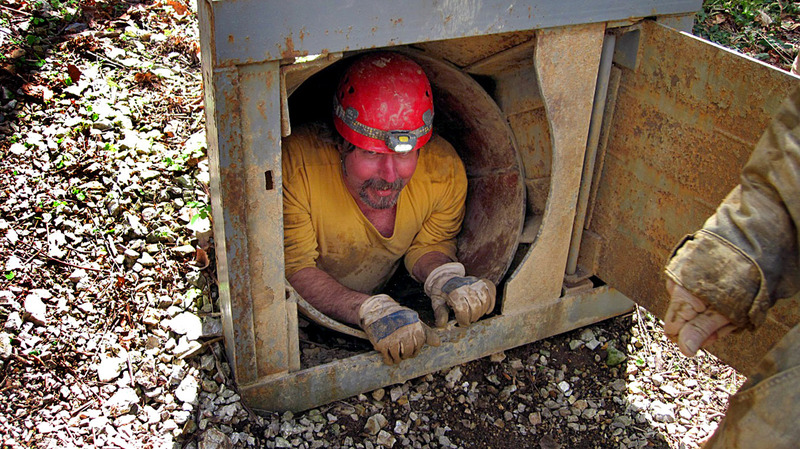 Mike Shank went down the 8 foot long 2 foot diameter gas pipe and spotted the cavers as they slid down into the darkness. Once everyone was down I went in and locked the gate behind. I met up with the team in the large area at the top of Clastic Canyon where I secured the key under a rock and made sure everyone knew where it was. Now to start caving! The crew slid down the steep scree slope, admiring the large passage and scenic flowstone display on the right side of the passage. After assembling towards the bottom of Clastic Canyon we headed down Bourbon Street. This starts out as walking passage, but then slowly turns into crawling passage. We admired the mud sculptures and proceeded past the 2 squeezes into the flowstone slide. I rigged the top with webbing, a ‘biner and etrier to make coming back up this slick area a little easier. The crew came down and took turns looking into the pit at the bottom, with a few being daring enough to slide down in, then climb out. While small it has some brown crystals and popcorn formations. Like a lot of situations, it’s easier to get in, than get out, but we all survived. Above picture is the team taking a break in Bourbon Street. Back up the slide we went, squiggling through the squeezes, back into the mud room where I got a nice group shot, then back into Clastic Canyon. 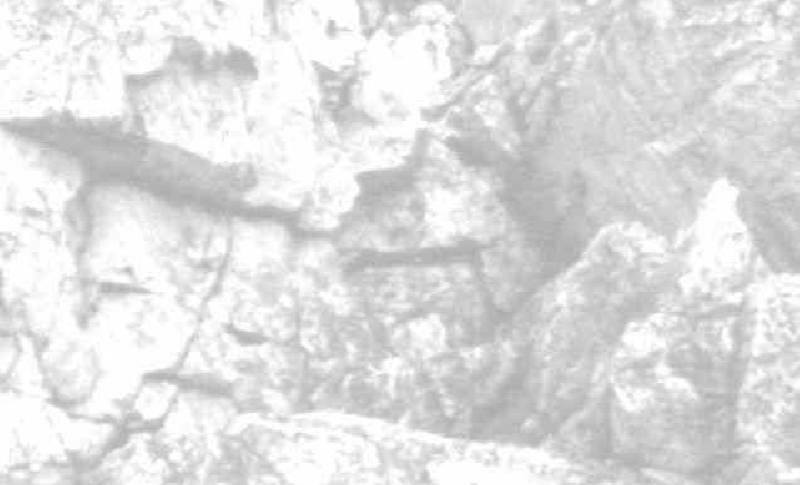 Here we regrouped and debated on the next passage to explore. The passage to the Wind Chamber was nearby, but there was exposure(risk of a fall due to proximity to pit or deep fissure) followed by some crawling and a downclimb which is difficult for short people (like myself). 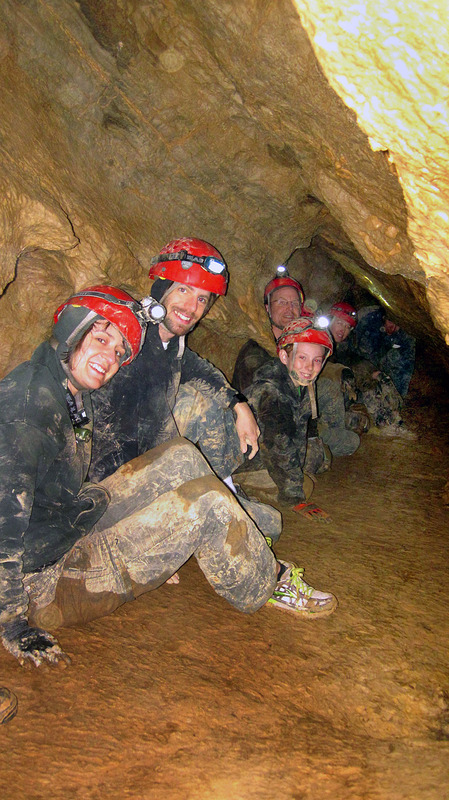 We decided to head for the Fissure Passage which is where the greatest extent of the cave lies. Back up Clastic Canyon we went, until we came to the innocuous small hole on the left named the Rabbit Hole. It’s a tight fit, but quickly opens up. Through we went , then down to the left into the Fissure Passage. This is a good place to introduce people to canyoning since it starts off fairly easy and low to the ground and gets progressively higher with some more challenging spots as you progress. It allows a fairly easy exit to a new person who may feel they’re getting in over their heads. We proceeded slowly with advice being given about foot and body placement and the crew did well. After we hit the midpoint, some decided to head back, while Mike Shank, Mike, David and son David, and myself continued. 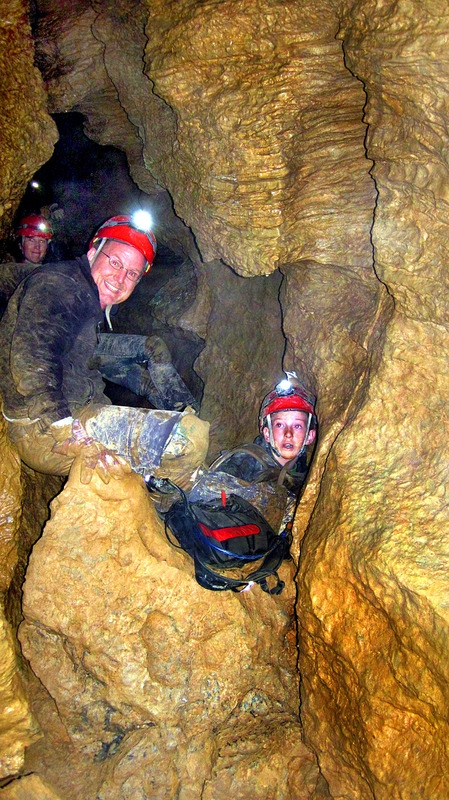 David, his son, and Elyshia in the Fissure Passage. At this point the toughest part of the Fissure Passage was over. Down the passage we went, where you have to awkwardly hurl yourself over a rock slab and climb down. You work to get down safely and work harder to get back up. After this we cruised a short distance and found ourselves at the climbdown to the Voodoo Dome room. I advised the team to take the small passage on the right which brings you out to an exposed area overlooking the impressive dome pit. I took the high way down, it’s a little exposed but is much easier than the crawl. Down we climbed and we landed in one of the main features of the cave. It has a large suspended boulder in the ceiling the size of a small truck which looks like it’s held up with slivers of rock. There was more water dripping from the ceiling than I’ve ever seen, you couldn’t get out of it, almost like being in a light shower. We took some pictures, then headed back. After exiting the Fissure Passage we broke out into Clastic Canyon and met the rest of the team. Todd had already unlocked the gate and we exited our underground wonderland. It was a lot of fun and some of us went beyond our comfort zone in terms of claustrophobia and fear of heights to experience the spirit of true adventure. I’m sure many will look forward to getting more experience in the land of mud and eternal darkness. Out at last! We all survived and had a great experience, can’t wait for the next trip.